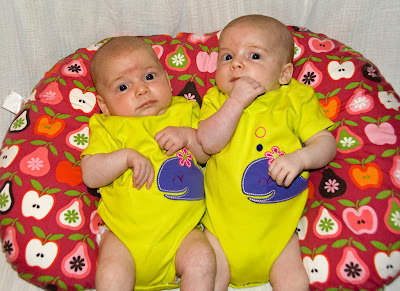 Welcome to Married Life: Two Month Old Girls! 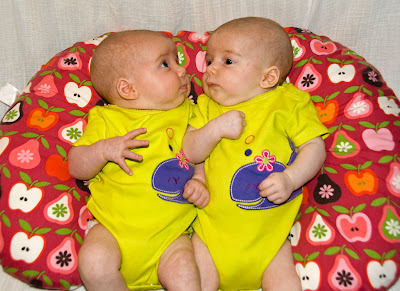 My babies are two months old already! It of course seems like forever and also not like forever since they were born. The last two months are mostly a blur... good thing I have pictures to help me remember! The girls are starting to make sounds now (other than grunting and screaming) and it's almost startled me a couple times to hear them coo! A smile here or there, but not too much interaction yet. Although they have started to notice and stare at the toys on their bouncers a bit more. The past couple of weeks have been really hard. I think they may have a gluten sensitivity as well so I've gone gluten free (that's another post in and of itself!) and Joy is having a LOT of issues nursing. To the point that I've started pumping and feeding her a lot more from the bottle. She has a doctor's appointment on Friday to see if she's tongue tied. I kind of hope she is because it's a simple fix and hopefully then we can move on. If not... I am not a fan of pumping. Poor girl weighs less than her sister because I didn't realize she wasn't getting enough to eat. It's amazing how long she'll sleep now that she has food in her tummy. 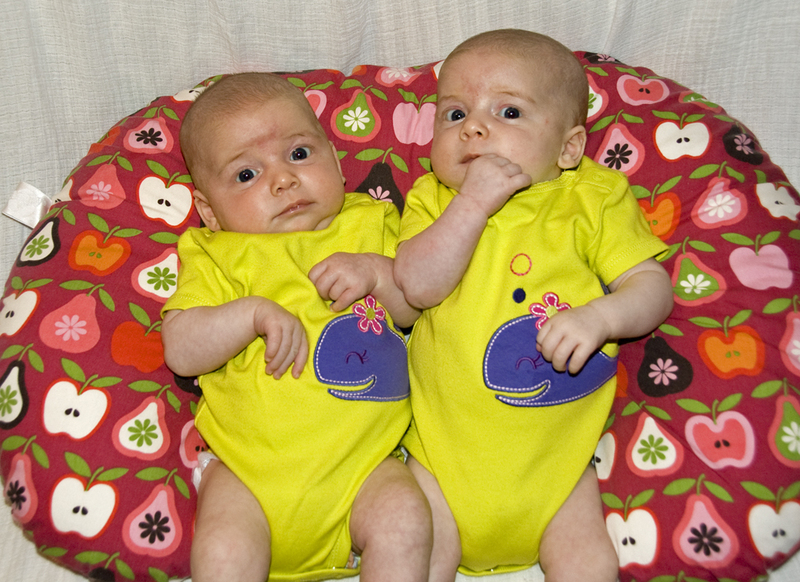 They have both outgrown the newborn clothes though and are in 0-3 and 3 month clothes now. Lots of cute clothes! "My babies are two months old already! It of course seems like forever and also not like forever since they were born." It's the same feeling for me with my oldest two (out of 5, youngest one about the same age as your girls). My two oldest are 20 and 18 and they were newborn just DAYS ago, right?